from a plain reading of section 56(2)(vi) along with the Explanation to that section and on understanding the intention of the legislature from the section, we find that a gift received from “relative”, irrespective of whether it is from an individual relative or from a group of relatives is exempt from tax under the provisions of section 56(2)(vi) of the Act as a group of relatives also falls within the Explanation to section 56(2)(vi) of the Act. It is not expressly defined in the Explanation that the word “relative” represents a single person. And it is not always necessary that singular remains singular. Sometimes a singular can mean more than one, as in the case before us. In the case before us the assessee received gift from his HUF. The word “Hindu Undivided Family”, though sounds singular unit in its form and assessed as such for income-tax purposes, finally at the end a “Hindu Undivided Family” is made up of ‘a group of relatives”. Thus, in our opinion, a singular words / words could be read as plural also, according to the circumstance / situation. To quote an example, the phrase “a lot”. Here, the phrase “a lot” remains as such, i.e. plural, in all circumstances and situations, where in the case of “one of the friends” or “one of the relatives”, the phrase remains singular only as the phrase states so that one amongst the relatives and at no stretch of imagination it could mean as plural whereas in the phrase “a lot” the words “a” and “lot” are inseparable and if split apart both give distinctive numbers, i.e. “a” singular and “lot” plural and whereas when read together, it can only read as plural in number unlike in the case of “one of the relatives” where “one” is always singular in number whereas “relatives” is always plural in number, but when read together it could read as singular in number. Applying this description with the case on hand, we have already found that though for taxation purpose, an HUF is considered as a single unit, rather, an HUF is “a group of relatives” as it is formed by the relatives. Therefore, in our considered view, the “relative” explained in Explanation to section 56(2)(vi) of the Act includes “relatives” and as the assessee received gift from his “HUF”, which is “a group of relatives”, the gift received by the assessee from the HUF should be interpreted to mean that the gift was received from the “relatives” therefore the same is not taxable under section 56(2)(vi) of the Act, we hold accordingly. The Revenue is aggrieved by the impugned order dated 24/12/2013 of the Ld. First Appellate Authority, Mumbai, deleting the disallowance of Rs.85 lakhs received as gift from HUF without appreciating the fact that HUF does not come under the term ‘group of relatives’ defined u/s 56(2) of the Income Tax Act, 1961. 2. During hearing, Shri R.P. Meena, ld. CIT-DR, defended the addition made by the Ld. Assessing Officer by advancing arguments, which is identical to the ground raised by contending that the terms HUF does not come under the term ‘group of relatives’ defined u/s 56(2) of the Act. 2.1. On the other hand, Shri Hari Raheja, ld. 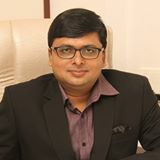 Counsel for the assessee, defended the impugned order by contending that the case of the assessee is squarely covered by the decision of the Rajkot Bench of the Tribunal in the case of Veenit Kumar Rahgavjibhai Bhalodia vs ITO (2011) 140 TTJ (Rajkot) 58; (2011) 12 ITR 616 (ITAT). This factual matrix was not controverted by the Revenue. “Appeal in ITA No.583/Rjt/2007 is a quantum appeal filed by the assessee against the order of CIT(A)-IV, Rajkot dated 23-1 0-2007 for the assessment year 2005-06 whereas the appeal in ITA No.601/Rjt/2008 is filed by the revenue against the order of the CIT(A)-IV, Rajkot dated 24-10-2007 also for the assessment year 2005-06 whereby he deleted the penalty of Rs. 20,31,720 imposed by the assessing officer u/s 271(1 )(c) of the Act. “1. The C.I.T. (Appeals) erred in upholding the addition of Rs.60,00,000/- under sec.56 of the I.T. Act, 1961 on account of receipt by the assessee from the HUF of which the assessee was the member. 2. The C.I.T.(Appeals) further erred in law and on fact in not appreciating the alternative contention of the assessee that the receipt is otherwise exempt under sec.10(2) of the I.T. Act, 1961. 3. The brief facts relating to grounds 1 & 2 are that during the course of assessment proceedings the assessing officer noticed that the assessee has accepted gift of Rs.60 lakhs from Shri Raghavjibhai Bhanjibhai Patel (Bhalodia) HUF on 21-03-2005 and Shri Raghavjibhai Bhanjibhai (indial) of Rs.40 lakhs on 21-03-2005. The assessing officer was of the view that HUF is not covered in the definition of “relative”. Therefore, the gift of Rs.60 lakhs received from the HUF was held to be taxable. 4. The CIT(A) confirmed the view of the assessing officer that the term “relative” is defined in Explanation to Proviso to clause (v) of sub section (2) of section 56 of the I.T. Act. The CIT(A) further observed that if the legislature wanted that money exceeding Rs. 25,000 is received by the member of the HUF from the HUF is also not chargeable to tax, it would have specifically mentioned so in the definition of “relatives”. The CIT(A) also considered the alternative submissions of the assessee that the said gift is exempt u/s 10(2) of the Act. The CIT(A) observed that section 10(2) of the Act read with section 64(2) of the Act, which means section 10(2) of the Act speaks about only that sum being exempt in the hands of the coparcener which is equal to his share in HUF. In other words, u/s 10(2) of the Act if the sum is received by any coparcener of HUF on partial or total division is exempt. The case under consideration is not a case that the said amount of Rs.60 lakhs received by way of total or partial partition of the HUF. The CIT(A) further observed that the above section speaks about sum received by a member of HUF if the same is out of income of the estate belonging to the family. If section 10(2) is read with section 64(2) of the Act, what is to be seen is that sum received by a member of the HUF from the income of the HUF cannot exceed the amount which can be apportioned to his share in the estate or property or asset of the HUF. The CIT(A) held that the assessee has failed to make out a case either before the assessing officer or before him to prove and to establish that Rs.60 lakhs received from HUF is equal to or less than the income which can be apportioned to his share of income in the HUF. The CIT(A) has also considered section 10(2A) of the Act and compared with share in partnership firm. The CIT(A) held that the said section 1 0(2A) is clear that only that much share from the total income of the firm is exempt in the hands of the partner as to which bears to his share in the firm the same proportion as the amount of his share in the profits of the firm in accordance with the partnership deed bears to such profits. The assessee failed to establish such share from HUF. 5. The ld.AR submitted that the revenue authority has failed to appreciate that amount received from father’s HUF is received from relative as father and all the persons comprising HUF are relatives within the meaning of Explanation to Proviso to section 56(2) of the Act. He submitted that HUF is a relative inasmuch as HUF is a collective name given to group consisting of individuals, all of whom are relatives under Explanation to Proviso to section 56(2) of the Act. The ld.AR submitted that the term “individual” would include a group of individuals, hence, an HUF would be covered by the term “individual”. The ld.AR, in support of his contention relied upon the judgment of Karnataka High Court in the case of CWT vs Apna ((CP) 202 ITR 678. the ld.AR has also relied upon the judgment of jurisdictional High Court in the case of CIT vs Gunwantlal Ratanchand 208 ITR 1028 (Guj). The ld.AR has, further relied upon the judgment in the case of Jain Merchants’ Co-operative Housing Society Ltd & Ors vs HUF of Manubhai Kalyanbhai Shah in Special Civil Application Gujarat Law Reporter XXXVI(1) page 19 and submitted that in the said judgment the term “individual” is held to include group of individuals as also joint families. 8. The ld.AR lastly submitted that if two views are possible, the one beneficial to the assessee has to be adopted. For this proposition the ld.AR relied upon the judgment of the Hon’ble Apex Court in (2002) 258 ITR 761 (SC) Union of India vs Onkar S Kanwar. 9. The ld.DR on the other hand relied upon the order of CIT(A) and submitted that the CIT(A) has analysed the case in detail at paragraph 6 of his order before confirming the order of the assessing officer. The CIT(A) has also considered the alternative submissions made by the assessee that his case is covered u/s 10(2) of the I.T. Act. The ld.DR submitted that the assessee himself is not sure about the facts whether section 10(2) of the Act is applicable or Explanation to section 56(ii) of the Act is applicable. The ld.DR submitted that the term “relative” is defined in section 2(41) wherein HUF is not included. The ld.DR further submitted that the object of section 10(2) pointed out by the ld.AR is only in respect of partition and not in case of gift. It is also the submission of the ld.DR that cases cited by the ld.AR are not applicable as under the I.T. Act, the “person” has been separately defined under the Act and HUF is a separate person. The ld.DR submitted that how a gift can be given to himself. The ld.DR in support of his contention relied upon the judgment of Karnataka High Court in the case of Patil Vijaykumar & Ors vs UOI 151 ITR 48 . (2) Whether amount received by assessee from his HUF is covered by section 10(2) of the Act? 11.1 A Hindu Undivided Family is a person within the meaning of section 2(31) of the Income-tax Act and is a distinctively assessable unit under the Act. The Income-tax Act does not define expression ‘Hindu Undivided Family”. It is well defined area under the Hindu Law which has received recognition throughout. Therefore, the expression ‘Hindu Undivided Family” must be construed in the sense in which it is understood under the Hindu Law as has been in the case of Surjit Lal Chhabra vs CIT 101 ITR 776(SC). Actually a ‘Hindu Undivided Family” constitutes all persons lineally descended from a common ancestor and includes their mothers, wives or widows and unmarried daughters. All these persons fall in the definition of “relative” as provided in Explanation to clause (vi) of section 56(2) of the Act. The observation of the CIT(A) that HUF is as good as ‘a body of individuals’ and cannot be termed as “relative” is not acceptable. Rather, an HUF is ‘a group of relatives’. Now having found that an HUF is ‘a group of relatives’, the question now arises as to whether would only the gift given by the individual relative from the HUF be exempt from taxation and would, if a gift collectively given by the ‘group of relatives’ from the HUF not exempt from taxation. To better appreciate and understand the situation, it would be appropriate to illustrate an example, thus – an employee amongst the staff members of an office retires and in token of their affection and affinity towards him, the secretary of the staff club on behalf of the members of the club presents the retiring employee with a gift could that gift presented by the secretary of the staff club on behalf of the staff club be termed as a gift from the secretary of the staff club alone and not from all the members of the club, as such? In our opinion answer to this quoted example would be that the gift presented by the secretary of the club represents the gift given by him on behalf of the members of the staff club and it is the collective gift from all the members of the club and not the secretary in his individual capacity. And if it is held otherwise, it will lead to an absurdity of interpretation which is not acceptable in interpretation of statutes as has been held by the Hon’ble Apex Court in the case of K G Govindan & Sons vs CIT 247 ITR 192 (SC). 11.2 Further, from a plain reading of section 56(2)(vi) along with the Explanation to that section and on understanding the intention of the legislature from the section, we find that a gift received from “relative”, irrespective of whether it is from an individual relative or from a group of relatives is exempt from tax under the provisions of section 56(2)(vi) of the Act as a group of relatives also falls within the Explanation to section 56(2)(vi) of the Act. It is not expressly defined in the Explanation that the word “relative” represents a single person. And it is not always necessary that singular remains singular. Sometimes a singular can mean more than one, as in the case before us. In the case before us the assessee received gift from his HUF. The word “Hindu Undivided Family”, though sounds singular unit in its form and assessed as such for income-tax purposes, finally at the end a “Hindu Undivided Family” is made up of ‘a group of relatives”. Thus, in our opinion, a singular words / words could be read as plural also, according to the circumstance / situation. To quote an example, the phrase “a lot”. Here, the phrase “a lot” remains as such, i.e. plural, in all circumstances and situations, where in the case of “one of the friends” or “one of the relatives”, the phrase remains singular only as the phrase states so that one amongst the relatives and at no stretch of imagination it could mean as plural whereas in the phrase “a lot” the words “a” and “lot” are inseparable and if split apart both give distinctive numbers, i.e. “a” singular and “lot” plural and whereas when read together, it can only read as plural in number unlike in the case of “one of the relatives” where “one” is always singular in number whereas “relatives” is always plural in number, but when read together it could read as singular in number. Applying this description with the case on hand, we have already found that though for taxation purpose, an HUF is considered as a single unit, rather, an HUF is “a group of relatives” as it is formed by the relatives. Therefore, in our considered view, the “relative” explained in Explanation to section 56(2)(vi) of the Act includes “relatives” and as the assessee received gift from his “HUF”, which is “a group of relatives”, the gift received by the assessee from the HUF should be interpreted to mean that the gift was received from the “relatives” therefore the same is not taxable under section 56(2)(vi) of the Act, we hold accordingly. 12. Now coming to the alternative contention of the assessee that gift received by the assessee from the HUF fall under section 10(2) of the Act. Section 10(2) of the Act provides that tax shall not be payable by an assessee in respect of any sum which he receives from a member of Hindu Undivided Family and as the sum has been paid out of the family income, or in the case of an impartible estate, whose such sum has been paid out of the income of the estate belonging to the family, subject however, to the provisions of section 64(2) of the Act. The object of the provision is that a Hindu Undivided Family, according to section 2(31) is a “person” and a unit of assessment. Income earned by a HUF is assessable in its own hands, so as to avoid double taxation of one and same income once in the hands of the HUF which earns it, and again in the hands of the member whom, it is paid. In respect of the family property qua its members it has been held by various authorities and courts that there is an antecedent title of some kind of a Member in the properties of HUF and a family arrangement which merely acknowledges and defines how that title is looked at and it is not an alienation of property at all. But even if it should be regarded as a transfer, the object of avoiding family litigation is consideration in money’s worth. The real consideration in a family arrangement is based upon a recognition of a preexisting right hence, there is no transfer of property at all. The Hon’ble Apex Court in CGT vs NS Getti Chettiar 82 ITR 599 (SC) based its observation on that ground in a case of unequal family partition and held that it is not transfer, hence no gift tax liability is attracted. Every member of the HUF has a claim as to his maintenance. Receiving anything in consideration of his pre-existing right in a property or income covers by section 10(2) of the Act. 12.1 There are two ways involved in a transaction, i.e. (i) amount given and (ii) the amount received. If we relate the provisions of Income-tax Act to these ways of “given” and “received” in case of an HUF we find that the case of amount received by an HUF from its member is provided in section 64(2) of the Act. Section 64(2) was inserted by the Taxation Laws (Amendment) Act, 1970 with effect from 01-04-1971. This section was inserted to avoid creation of multiple HUFs and others. Similar provisions was also inserted in the Gift-tax Act, 1958 and accordingly transfer of assets in such case was termed as deemed gift. The provisions of section 64(2) provides that – where in the case of an individual being a member of a Hindu undivided family, any property having been the separate property of the individual has been converted by the individual into property belonging to the family through the act of impressing such separate property with the character of property belonging to the family or throwing it into the common stock of the family or been transferred by the individual, directly or indirectly, to the family otherwise than for adequate consideration then, notwithstanding anything contained in any other provisions of this Act or in any other law for the time being in force, for the purpose of computation of the total income of the individual under this Act. The individual shall be deemed to have transferred the converted property, though the family, to the members of the family for being held by them jointly. The income derived from the concerted property or any part thereof shall be deemed to arise to the individual and not to the family. Where the converted property has been the subject-matter of a partition (whether partial or total) amongst the members of the family, the income derived from such converted property as is received by the spouse on partition shall be deemed to arise to the spouse from assets transferred indirectly by the individual to the spouse and the provisions of sub-section (1) shall, so far as may be, apply accordingly. We find that to cover the transaction between a member of HUF and the HUF the Income-tax Act provides section 10(2) and section 64(2). Section 10(2) is not similar to section 64(2). It deals with the transaction differently which would mean that the legislature in their own wisdom was aware about the circumstances and accordingly provisions are enacted in the Act. Therefore, in our opinion, both the situation of amount received and amount given to HUF by a member is to be dealt with accordingly. 12.2 The CIT(A) while considering sections 10(2) and 1 0(2A) of the Act held that firstly the amount received on partial partition or on partition is only exempt and secondly to the extend of share of assessed income of HUF for the year would only be exempt. We are not in agreement with the view of the CIT(A). Firstly, there is no provision in the Act to contend that it is applicable only to the extend of income of the year. Secondly, the property or the income of HUF belongs to the members thereof who are either entitled to share in the property on partition or have a right to be maintained. For getting exemption under section 10(2) two conditions are to satisfy. Firstly, he is a member of HUF and secondly he receives the sum out of the income of such HUF may be of earlier year. 13. In the light of above discussion, we find that the assessee received gift from HUF and has satisfied both the conditions of section 10(2) that the assessee is a member of HUF and received amount out of the income of family. There is no material on record to hold that the gift amount was part of any assets of HUF. It was out of income of family to a member of HUF, therefore, the same is exempt u/s 10(2) of the Act. We hold accordingly. 14. The other issue in the appeal pertains to charging of interest u/s 234B and 234C of the Act. Charging of interest u/s 234B and 234C being consequential in nature, the assessing officer is directed to allow consequential relief to the assessee. 15. The assessing officer imposed penalty of Rs. 20,31 ,720 u/s 271 (1 )(c) as he did not accept the gift of Rs.60 lakhs received by the assessee from the HUF. On appeal, the CIT(A) deleted the same. We have heard the parties on the issue. We have deleted the quantum addition of Rs.60 lakhs while dealing with the appeal filed by the assessee in ITA No.583/Rjt/2007 in above paragraphs. As such the impugned penalty has no leg to survive. Therefore, we uphold the order of the CIT(A) and dismiss the appeal of the revenue. 2.2. If the observation made in the assessment order, leading to addition made to the total income, conclusion drawn in the impugned order, conclusion drawn in the order of the Tribunal, material available on record, assertions made by the ld. respective counsels, if kept in juxtaposition and analyzed, we find that while adjudicating the issue, the Bench duly considered section 56 of the Act and on the question of chargeability of tax on a question whether a gift received from relative held that it is exempt from tax under the provision of section 56(2)(vi) of the Act on a question whether HUF is a group of relatives, it was held that the gift received from HUF would be exempt from tax u/s 56(20(vi) of the Act. It is noted that in the case before Rajkot Bench of the Tribunal, the amount was received from HUF, where the assessee was also member of HUF. In the light of the aforesaid decision of the Tribunal, we find no infirmity in the conclusion drawn by the Ld. Commissioner of Income Tax (Appeals) as the same decision has been followed therein. Resultantly, the appeal of the Revenue is dismissed. Finally, the appeal of the Revenue is dismissed. This order was pronounced in the open in the presence of ld. representative from both sides at the conclusion of the hearing on 18/04/20 17.